In some situations, you need to be stealthy. But you can't be stealthy when the tip of your wand is providing light by the use of a charm called Lumos. If you are in that kind of a situation where you don't want to be seen, Wand-Extinguishing Charm is the way to go. Wand-Extinguishing Charm is also called Nox. You will learn Nox in year one chapter five of Harry Potter: Hogwarts Mistery mobile game from Professor Flitwick. So, the original spell for providing light from the tip of your wand is called Lumos or Wand-Lighting Charm. Lumos will make your wand light up and it will decay over time or it will extinguish when you lose focus. If you want to immediately "power off" your wand you will need to cast a charm called Nox that also means "night" in Latin. In order to extinguish your wand, you will need to learn everything about Nox and how to properly cast it. For you to do that, you will need to pay close attention to the Charms Class. First, you will need to finish a pre-class in order to get you to the Nox charm. You will have to spend a lot of energy in order to learn all the information you need. You will need to focus really hard on this charm. Especially when you are on a secret mission where you can't be seen. If you lose focus, even a little, you will end up empowering your Lumos charm, which means that your wand will light up even more and you will be seen by everyone else in that room or field you are located on. When you've done everything, Professor Flitwick will assume you are ready to give it a go and try to extinguish the light from the tip of your wand. The wand movement will be a little tricky, unlike the Lumos charm that is an upside letter " V ". If you manage to do it correctly and cast Wand-Extinguishing Charm, the ball of light coming from the top of your wand will immediately disappear. 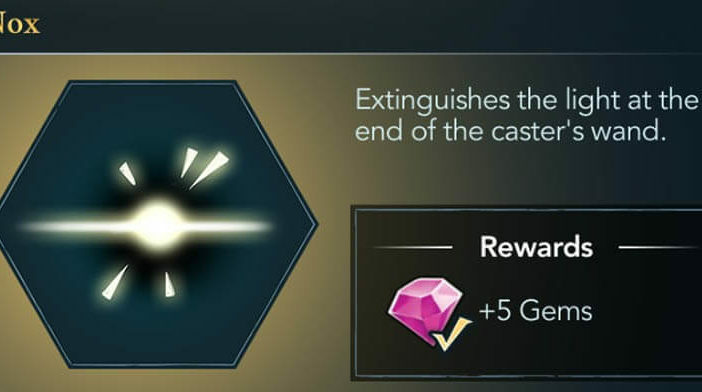 Learning Nox, or Wand-Extinguishing Charm will earn you +5 Gems that you can spend on many in-game features like clothes, accessories and even on energy packs.